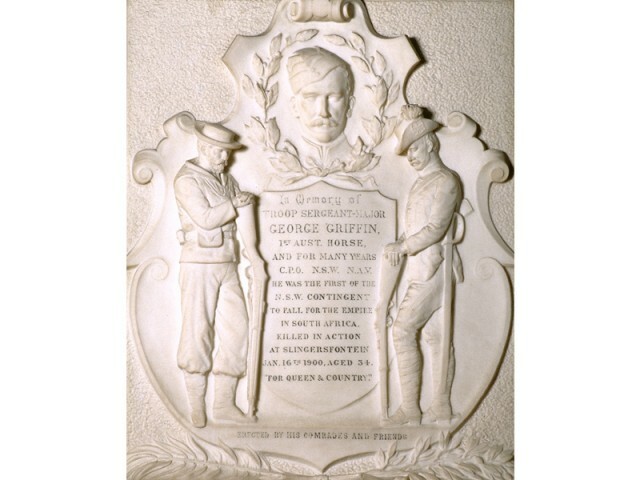 James White's marble memorial to Troop Sergeant-Major Griffin commemorates the first Australian soldier to die in the Boer War. Photo Greg Piper. The rich plaster modelling around the Vestibule is inspired by the architecture of Classical Greece and Rome. Photo Greg Piper. 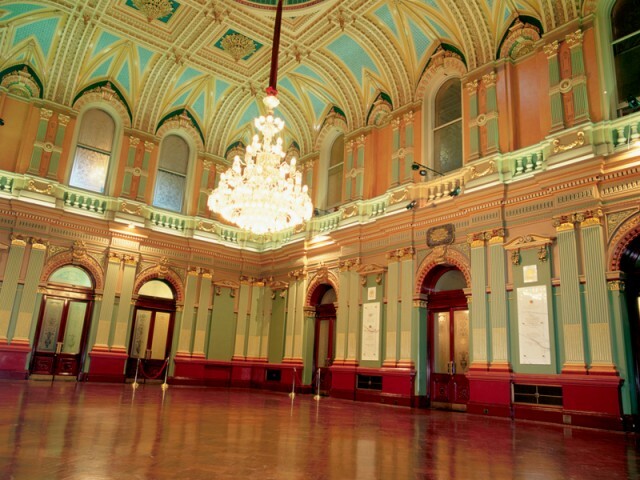 Imported from Europe, the chandelier was in place for a luncheon for the Duke of Manchester in October 1880. Photo Greg Piper. 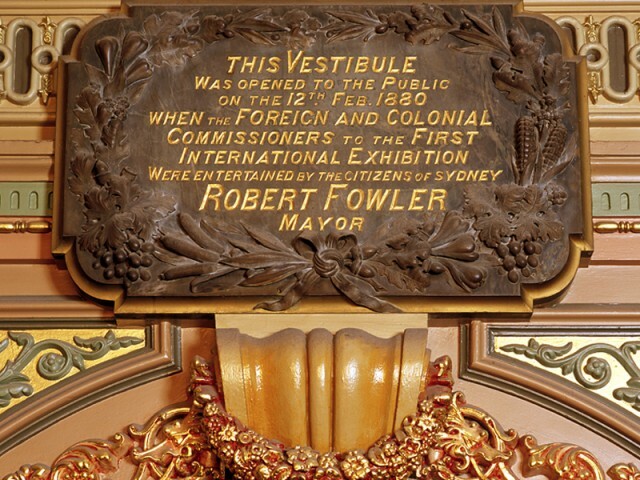 The first event held in the Vestibule was a mayoral reception for the commissioners of the Sydney International Exhibition in 1880. Photo Greg Piper. The decorative stained glass panels representing the four Classical elements and eight virtues are rare examples of curved stained glass. Photo Greg Piper. 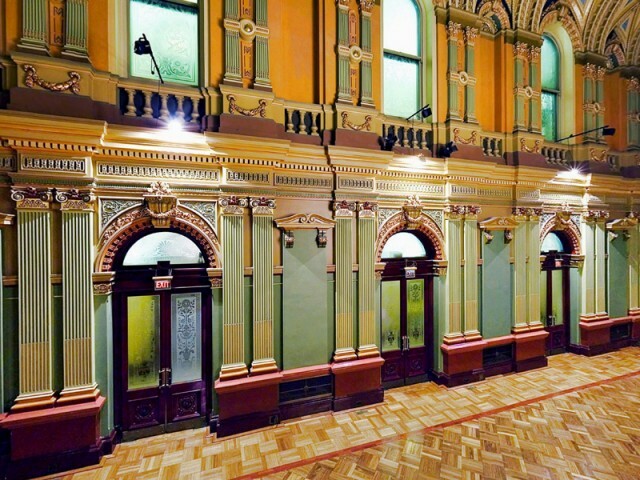 Regarded as one of the most significant Victorian interiors in Australia, the Vestibule of Sydney Town Hall is a lavish combination of colour and ornament and a stunning tribute to the artistic skills and craftsmanship of Sydney’s early colonial artisans. Completed in 1880, in time for the concluding celebrations of Sydney’s successful international exhibition in the Garden Palace, the space has continued to a spectacular backdrop for many events on Sydney’s annual social, cultural and community calendar. 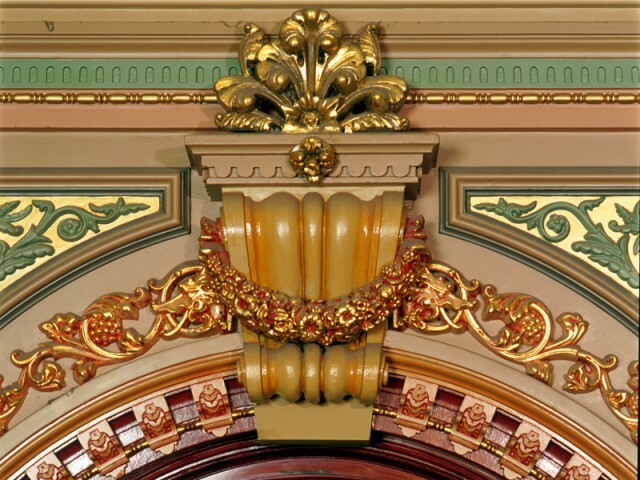 The crisply detailed plasterwork which defines the character of this magnificent space borrows influences from Moorish and neo-Classical architecture, fashionable in the mid 19th century. 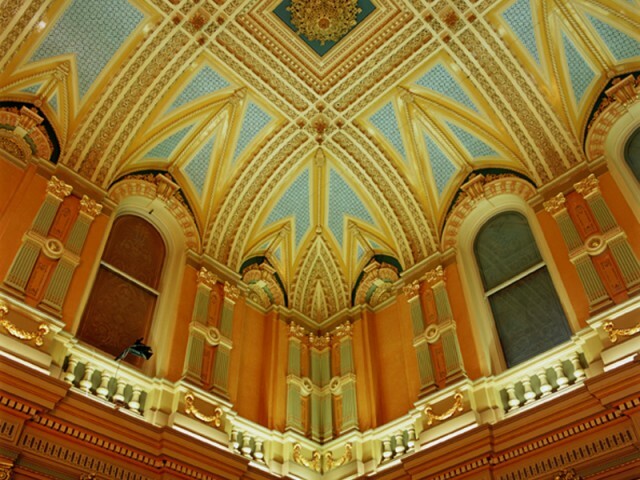 A complex polychrome palette of over forty different colours and 22 carat gilt highlights embellish the hundreds of swags, scrolls, geometric ornament and fine plaster tracery which decorate the walls and ceiling. 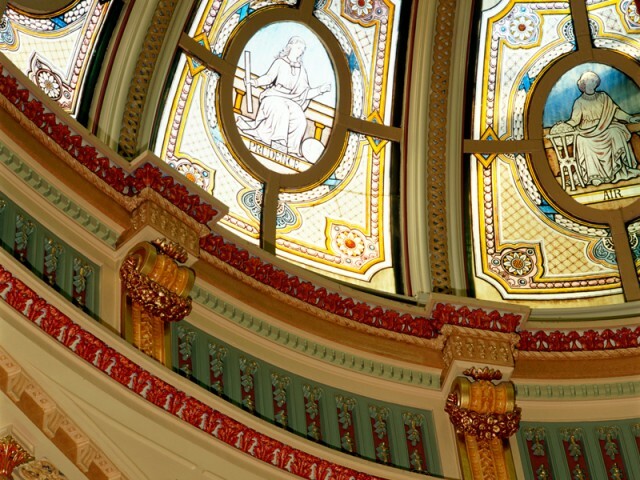 High above the double-storey space is a large elliptical dome, decorated with 12 leadlight panels, each individually hand painted with an allegorical figure representing the four elements of Air, Earth Fire and Water and eight female figures as virtues representing Justice, Temperance, Industry, Prudence, Peace, Plenty, Trust and Liberty. 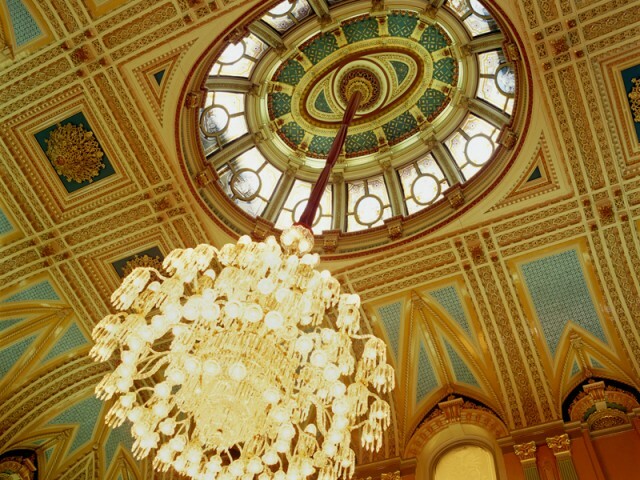 The large crystal chandelier suspended from the centre of the dome was installed in 1880 and is illuminated by over 160 light globes. Specially imported from Europe as the finishing touch to the splendour of the room, it was converted from gas to electricity in 1905.